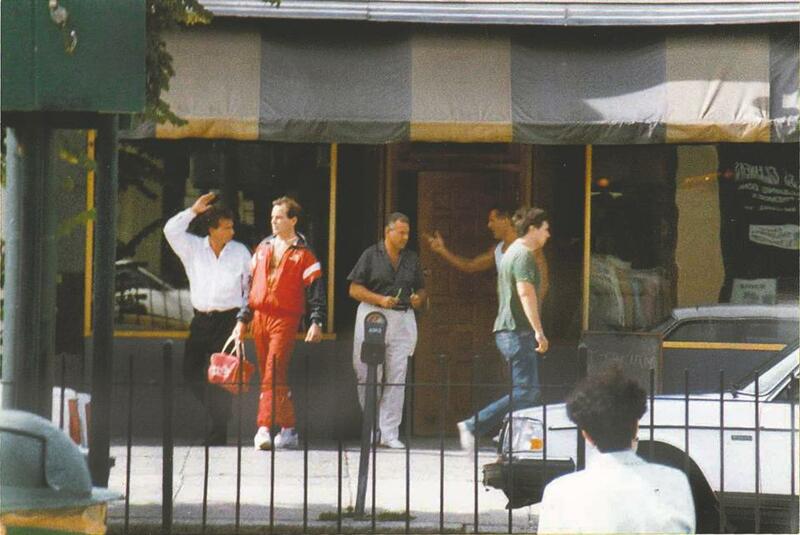 A 1990 State Police surveillance photo of (left to right) Steven DiSarro, Frank Salemme Jr., Thomas Hillary, and Francis “Cadillac Frank” Salemme coming out of a Brookline restaurant. The Salemmes allegedly killed DiSarro in 1993. Jurors in the murder trial of Francis “Cadillac Frank” Salemme will this morning hear a clandestine conversation the FBI intercepted 27 years ago in which the then-New England Mafia godfather disparaged a doomed Steven DiSarro as untrustworthy to high-level hoods visiting from Vegas. “The Channel is our (expletive) nightclub. We own it,” Frank Jr. crowed to a cooperating witness, according to a court document prosecutors filed Tuesday. Vince delaMontaigne, a former FBI special agent in Boston who was deep undercover in La Cosa Nostra for three years dabbling in drugs, bookmaking and loansharking, will introduce the 20-minute recording of Salemme Sr. and Natale “Big Chris” Richichi. DelaMontaigne testified yesterday tech agents armed with a court order were rolling tape and he was listening through the wall thanks to fibbing to the Hilton’s front desk that another room he’d checked into under an alias had “too much noise” from flights taking off and landing. As luck would have it, “They gave me 1408,” he said. Salemme, 84, softly drummed his left hand on the defense table yesterday as delaMontaigne described how the Boston bureau was tipped off Dec. 10, 1991, by its agent counterparts in Nevada that Richichi, a capo with New York’s Gambino crime family overseeing a crew in Las Vegas, was boarding a plane to Boston to meet with Salemme that night. He said the FBI “really didn’t know” what was going down, but went on high alert so agents could start tailing the now-late Richichi the second he landed at Logan. He recognized DeLuca from the FBI’s infamous October 1989 wiretap of the made man’s induction to the Mafia at a swearing-in ceremony in Medford. “We had surveillance agents on the parking lot, in the hotel,” he told jurors. The six men eventually left to have dinner at Ristorante Saraceno in the North End. When they later returned to the Hilton and Room 1410, he said Guarino and DeLuca excused themselves, leaving Richichi and Salemme to conduct boss business. The 18 jurors will be provided a 15-page transcript by prosecutors so they can follow along with the wiretap. DiSarro was killed in 1993. His remains, buried in a hazardous-waste dump on private property in Providence, were not located until 2016.